Scroll down to see our WolfPack 8x8 HDMI Matrix Routers which allow any 8 of 8-HDMI inputs to be sent to 8-HDMI video outputs. Because they are 8x8 HDMI Matrix Switchers, they allow any input to be routed to any output, or the same input to be sent to all outputs. Our 8x8 HDMI Matrix Switchers give you over 17,000,000 input and output combinations. Need more help? Just call our tech support line at 833-WOLFPACK or 833-965-3722 to discuss your application. 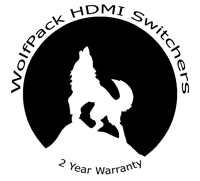 These WolfPack 8x8 HDMI Matrix Routers also has the added benefit of front-panel buttons for anyone that likes the accessibility of having them visible. Nobody likes to reach around behind their electronics searching for the right button. It becomes even more difficult if the switcher is placed in a location that does not allow access to the back of it.